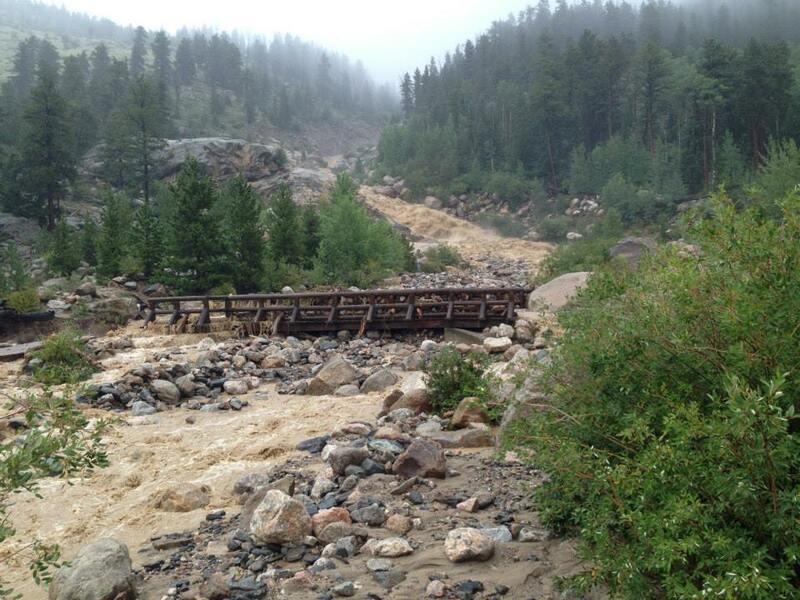 RMNP and Estes Park area severely flooded (Updated 11/15/13). Well, I am sure that most of you who are locals are well aware of the effects of the rains we've had in the past week. I've been talking to alot of people at work and so many have incurred damage from the flooding, and yet there are those who were spared. I count myself fortunate to be amongst the latter, yet head ten blocks south from my house and things are not just underwater but straight up gone. The St. Vrain River is more like a creek normally, about fifteen feet wide at maximum, and it blew my mind to see it stretch to over a quarter of a mile wide. Growing up on the east coast, I did have the experience of several hurricanes as well as Noreasters and the damage from them was nothing compared to this. 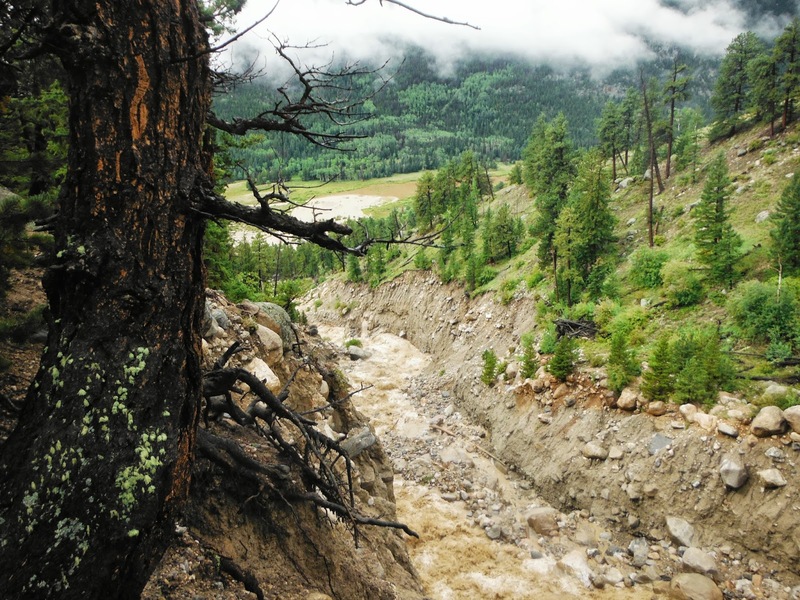 I have been reading reports and hearing from friends who live in them that some of the mountain towns that lie along creeks are not just flooded, but gone. Nothing left. And to think, last year at this time it was fire that was on everyone's mind. Now that seems far away. Estes seems to have been hit hard, with all roads in washed out, and the main road, route 36 apparently washed out completely in several places. It may be awhile before I am hiking in RMNP again. I am going to share some photos and videos below, some from myself and some from the park rangers and residents of Estes Park. RMNP will need some loving to get back into shape. It is a place that has touched many, and certainly near and dear in my heart. I am going to suggest at this time that you the reader and myself all band together and volunteer to help clean things up, repair trails, etc. when the time comes and the effort is needed. As I have said to my hiking partner many times, a day in the park is a good day. 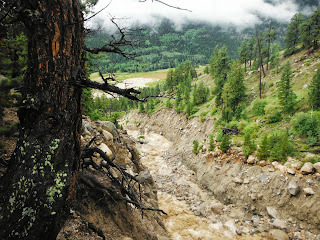 Alluvial Fan, photo copyright RNNP. September 2013. Alluvial Fan, hikingRMNP collection. May 2013. Junction of Lawn Lake and Ypsilon Lake trails, copyright RMNP. September 2013. A different perspective, but the same junction in May 2013, hikingRMNP collection. Looking down Horseshoe Falls copyright RMNP. September 2013. A similar view hikingRMNP collection. March 2013. Flood video from Estes Park, water running freely down streets. 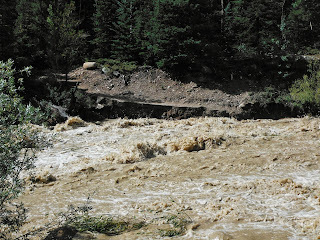 More flood video from Estes Park. 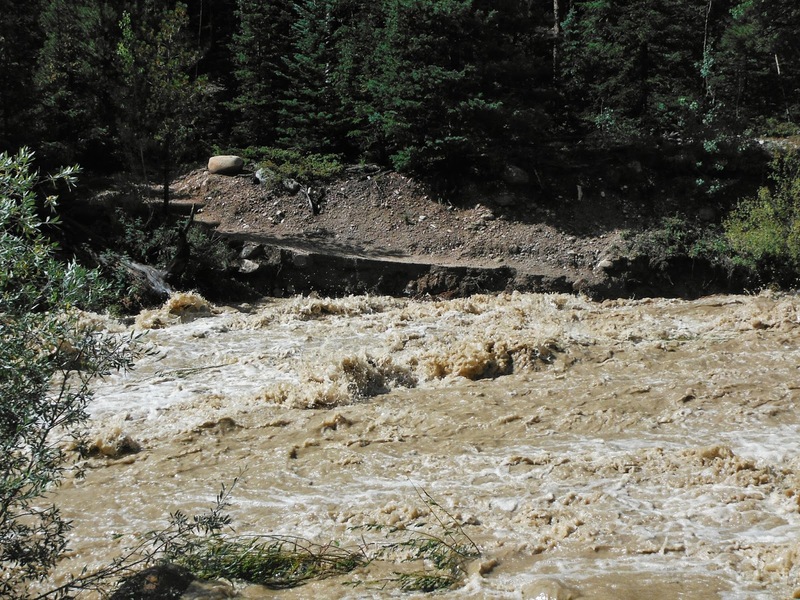 Video showing Big Thompson River, North Saint Vrain river. Times below, you can click to link directly to that portion of the video. 36 between Pinewood Springs and Estes isn't just damaged in one place, but missing completely in several places. @3:00 Enter Big Thompson Canyon @10:00 Enter Drake @18:00 Enter Estes Park @18:34 Fish Creek Rd begin, North to South @19:24 Country Club Dr @19:41﻿ breached lower earth dam: Carriage Hills. @20:27 Entrance to Little Valley @22:44 Cheeley Camp @23:00 Baldpate Inn/ hwy 7 @23:34 Massive Twin Sisters earth slide above Aspen Lodge @28:00 Big Elk Meadows Rd @29:05 Dead Man's Curve/ hwy 36 @29:40 Pinewood Springs @38:00 Lake Estes/ Olympus Dam @38:47 Starting at Switchbacks (to G Haven). A fly over of Longmont and Lyons on 9/16/13. Amazing to see so much water in the places I love to go. And some good news. RMNP is incrementally reopening to visitors! The west side of the park and trails are now open to day use only! Good news! RMNP is now 93% open! However, the furloughs have left rangers at home and amenities unavailable for the time being. This will also hinder rebuilding efforts. Hopefully we will soon have a road to get up there as well. Route 36 between Lyons and Estes Park opened up last week. I made the trip up this week. The road is in good shape, completely paved, though there are parts where it has narrowed and parts where the direction has changed completely. Driving up or down is a sobering experience, as you can see how much damage the road sustained as well as the destroyed houses and businesses around it. Please exercise caution! Fletcher Mountain and Quandary Peak. The recent rains and resultant floods have left our local stomping grounds off limits for the time being, though RMNP has reopened on the west side only. After a week of being stuck inside and viewing absolute destruction all around us, we both needed some time in the great outdoors. A few suggestions were made, and in the end we decided to go for Fletcher Mountain, which at 13951 feet is one of the centennials of Colorado, and then take the third class west ridge to Quandary Peak. We met up in Boulder at 4, and started on the trail just after six as the sun started to rise. We parked up at the dam to access Fletcher Mountain. We lost the trail early on, but made our way and were able to get back to it fairly quickly. And up we went. Since the trail starts so high, you barely spend any time at all in trees. The trail was relatively easy to follow over talus and tundra, but as we gained altitude, we encountered a problem that had not occurred to us: frost on the talus. Things were a little bit slippery and stayed that way until the top. But we got there! Looking south to North Star Mountain and Mount Lincoln. Cairn on the top. At 13951 feet, Fletcher Mountain is the 60th highest peak in Colorado, sharing this distinction with Gemini Peak. To the north. We decided to take some time and wait for the sun to rise over Quandary and zap some of the frost, but of course sitting there was a just a bit cold and windy. Down we went, hoping to find a better wind block and some warmth at slightly lower elevation. We found a bit of a warmer place, and sat again. We could tell the frost conditions had improved greatly as we descended. As the sun started hitting the west ridge of Quandary, we moved on to check things out, with the option of turning back if too icy. As we agreed later, though cold, sitting and waiting for a bit was the right call. In the end we experienced very little frost on Quandary, and only in shaded areas and in the upper 13's of elevation. Looking west along Quandary's west ridge. It was somewhere around here while on some very exposed third class that I opined my love of this sort of route. Dan on some fun third class. We did take our time and access the best way forward when we reached some of the harder looking sections. This area looked a little sketchy, but proved to not be bad at all. The soil was completely frozen, which turned loose scree into pretty stable terrain. More of the third class. At times, it looked like there were a few different possibilities existed, plus the option of harder fourth class terrain if a little more excitement was wanted. A neat little window to look south again. And then we were there. 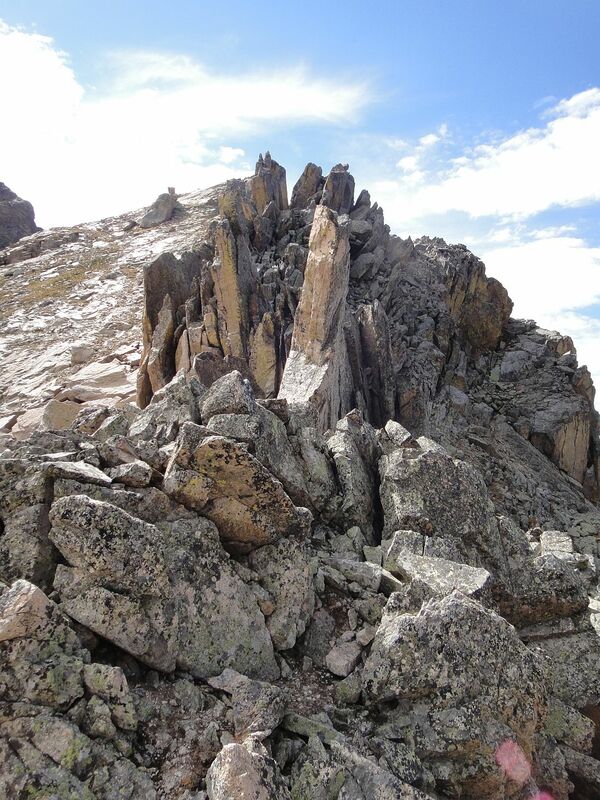 At 14265 feet, Quandary Peak is the thirteenth highest peak in the state. We noted two others making their way along the west ridge. Eventually they joined us on the summit. There were about ten different summit cairns. While I signed the register on Fletcher Mountain, I left this one untouched. We took a snack break on the top, enjoying the sights. After some time, we decided to head down, taking the standard route. This was (of course) much easier than the west ridge. Some good sights up into the bowl holding blue lakes. And a little traffic along the trail! They are pretty cute, and obviously well used to people, but still wild animals that need to be given their space. The aspen in the Breckenridge area as starting to change. There are still plenty that are bright green. In starting up at the dam, we now faced a two mile/nine hundred foot gain walk back to the car. It went by, but we were quite warm. Along the way we continued to pick up trash, which we started on the summit of the mountain. The day ended with a good collection. And when I looked in my bag for a final snack I found the cookie my wife got me but I had forgotten about! Yes! This was a fun hike for sure, though I remain unaccustomed to seeing tons of people on my normal outings. Quandary would be a good easy 14er for those less experienced by the standard route, and a good intro to third class when done by the west ridge for those of you looking to move up to more difficult terrain and route finding. Doing the combo is the way to go for something a little bit longer and more difficult. Drift Peak can be added in for a bit more length and more third class terrain if desired. Fletcher Mountain, 13951 feet: se ridge- 2.13 miles each way, 2250 foot gain. Second class. Moderate+. Quandary Peak, 14265 feet: west ridge- 2 miles each way, 2650 foot gain. Third class. Strenuous-. Quandary Peak: east ridge- 3.4 miles each way, 3450 foot gain. Moderate+. Hike total: 8.7 miles, 4015 foot gain. Strenuous-. Desolation Peaks and Flatiron Mountain via Chapin Pass TH. Another early wake up this week; alarm set for 2:15, planned meeting at three in Lyons. It was actually easy to get up since I felt like I never really fell asleep despite being in bed with lights out by nine the night before. Who needs sleep anyway? The drive up was as quick as it ever can be, and driving Old Fall River Road in complete darkness was interesting. We reached the trail head, which is really just a wide part of the road with parking on the left. On the trail, the familiar cone of illumination. Since the trail starts so high, treeline came quickly. At one point we stopped, turned off our headlamps, and took in the night sky. We could see a glow to the east- Estes Park and the Front Range beyond. We saw several shooting stars, and it was dark enough to see a satellite quickly orbiting the earth. After a few minutes of this awe inspiring sight, we continued on. Upon reaching the saddle between Chapin and Chiquita, we started up the Chiquita trail before cutting off in a northern direction to skirt the high points of Chiquita and Ypsilon. We found ourselves joining the ridge between Ypsilon and Desolation Peaks right as the day was lightening and the sun started to rise. East Desolation Peak on the left, and a great place to be as the sun rises. There are a few high points along the ridge to ascend or go around, but the going is relatively easy on tundra and stable talus. Every time I hike up here, I always think of how perfect this soil would be for making wine. The granite and scree is similar to what is found in some of the best places for growing Syrah- namely Hermitage and Cote Rotie. If only the land wasn't frozen for 6 months out of the year! and begins to play with some of the peaks near the continental divide. Another reason to get up early. Very soon we found ourselves at the place we would turn right to continue on to the peaks. We donned our helmets, and prepared mentally for the scrambling ahead. We found some cairns, and in reality getting to West Desolation Peak wasn't so bad at all, with a few third class moves the way we went. Good views abound, and though there is nothing named in this drainage, it sure looked like a pretty and secluded place to spend some time. We found a cairn east of the first high point on some slabby rock. It seemed to be leading us down in a southerly direction. We also identified another possible route through a gulley that looked pretty reasonable. And with less elevation loss and subsequent regain, that was our choice. En route to East Desolation Peak. Some of the rock here reminded me of what I encountered near The Cleaver. Ypsilon from near the top. This is the last obstacle to surmount on the way, and the crux comes near the top with a few somewhat awkward fourth class chimney moves. The summit holds enough room for several people. We found a register and added our names as the ninth and tenth ascents of the year. Despite the classed climbing near the end, it's not much more difficult to get here than to do CCY. Of course this is not a 13er and somewhat off the beaten trail which helps keep the traffic down. Looking south to more high points we'd climb before Flatiron Mountain. Looking back to East Desolation Peak. We came through the prominent v-shaped gulley to the right. It was definitely much easier and the only option really to stay on the north side of the ridge on the way to and back from East Desolation Peak. Here is Dan in the gulley for scale. A huge rock wall on the right! Shortly before we arrived at Flatiron Mountain, we guessed how many peoples names we might find in the register from this year, or how many actually continue on to this peak from Desolations. I said two, Dan said four. We were both wrong, as two camp groups of ten or so plus additional individual hikers summitted this mountain thus far in 2013. Summit cairn at Flatiron Mountain, Mummies behind. We ate and talked here, briefly considered doing CCY on the way back, but started noticing those puffy white clouds rolling it. In the end we decided to not gain any more elevation, but to basically contour to the south, avoiding some of the rocky cliffs on the west side of Ypsilon, to meet back with the trail somewhere on Chapin. This certainly did not prove to be as easy as it looked, but may not have taken any more time than going back up. Clouds were starting to build as we continued along. We both kept our ears peeled for thunder as things started to look threatening. It's funny how many airplanes we heard at this point. I'm sure they were flying over all day, but of course it was only once we really started to listen that we heard them. But eventually we did hear thunder, and it was pretty much exactly where we had just come from. Our route also kept us around treeline, with a quick escape downward as an option if needed. We finally hit upon the Ypsilon Trail, and looked back to notice rain falling in the valley we'd just come out of. Some gnarled trees along the trail. It was funny that earlier in the day we talked about how we probably could have left later and avoided the early wake up. We were just getting back to the truck, and hastened to get our packs and jackets off as the rain started to come. Within a minute, it was pouring. Just in time! From here it took a full hour to get out of RMNP. We got stuck behind two vehicles on Old Fall River Road moving at the glacial pace of five miles per hour who wouldn't pull out. By the time we reached Trail Ridge Road, we were in a full on thunderstorm, with lightning striking all over the place, but particularly concentrated right back where we just were. Now the 2:15 wake up made sense. Of particular concern was the fairly large number of people still getting out of their cars at the various pull offs we went by on the way back. At one point we had a strike that must've been 100 yards at most from the truck. Not something I'd want to be in. And then it started to hail! And I got even happier that I'd been awake for so long already! All in, this is not that bad of a hike. There is some up and down, but since the trail head is so high in elevation to start with, things remain pretty reasonable- I'd be surprised if we hit 3000 feet on the day. 2500 seems much more likely. The only thing to consider is the difficulty of the last twenty feet or so up to East Desolation Peak. If you are not comfortable in fourth class with tons of exposure, this one might not be for you (yet!). And as far as CCY, it'll be much easier from Chapin Pass than the way I did it. With a maximum gain of 2494 feet over 4 miles, I would have to give it a moderate+ to strenuous- rating. Desolation Peaks, 12949 feet: 5.1 miles each way, 1929 foot gain. Fourth class. Strenuous-. Flatiron Mountain, 12335 feet: 6.4 miles each way, 1325 foot gain. Second class. Moderate+. Chapin Pass, 11140 feet: .2 miles each way, 120 foot gain. Easy-.